Roy Carson was a collector's collector. Roy did more to put ALPCA on the map than anyone. If we had a position of plate Ambassador Roy would have retired it. He joined the club in 1955 and served as the first Vice President. He would go on to hold every office in the club except Treasurer. His membership number was 17 and his column "Seventeen Sez" was mandatory reading. A world traveler he was constantly spotting plates and reporting on them. He found a plate (1940 New Mexico) by the side of the road when he was eleven that said '1540 1940 CORONADO CUARTO CENTENNIAL' and he was hooked for life. His youth was full of turmoil. Roy was born in northern Nevada to a woman of the Cheyenne tribe, and was placed for adoption as an infant. He would live in numerous foster homes in his first nine years but knew no true happiness until he was adopted by Charles and Elaine Whitney of Delanson, New York. They treated him as a member of their family and instilled many of the values he would express in his life. Just after the end of World War II he discovered that his real name was Roy Alan Carson and learned some of the story of his family and name change. He worked for the post office and had a Foster Home license. He served as guardian for several young men (a reflection of his own upbringing) and he was the legal guardian for about six. Roy never married. He often took jobs that included travel and this wanderlust may have strained many a relationship. He subscribed to Hobbies Magazine where he read an article in the early 1950's about a license plate collector. Correspondence followed and Roy was among those listed in the famous "George letter" of 1954. Roy Carson created the first ALPCA membership roster. He was the first Newsletter Editor to bind the newsletter into a magazine. He acted as a worldwide correspondent with European collectors and represented ALPCA everywhere. 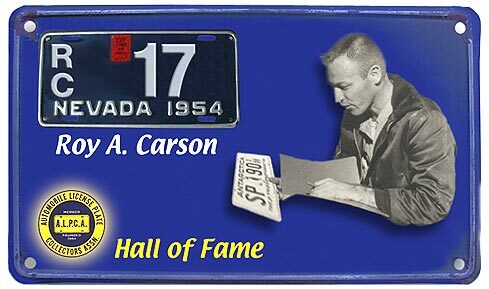 His personal knowledge of license plates worldwide was premier in this hobby for decades. His articles filled Newsletters for many years and became the foundation of the current club archives. Roy collected many things including animal licenses, dog tags and playing cards but is best remembered for his willingness to share his knowledge and encourage new collectors. Roy led a remarkable life and touched many of us. It is safe to say that ALPCA would not have prospered and flourished without "Seventeen Sez." We honor Roy Alan Carson as a member of the ALPCA Hall of Fame.